The top piece that screws on is labeled as a hp-7400, but from what I could find online.that was from an Ultegra headset not a 600. so this may not be the actual matching piece.The 600 models I found online were hp-6400 or 6500. We have over 2100 old school and retro BMX products (as well as hard to find stuff for other types of bikes) on our website. If you don't see what you're looking for here, there's a good chance we have it there. 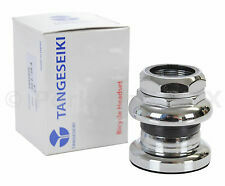 New in the box Silver Alloy headset by Tange. NJS Certified. 27.0mm crown race. Race Dia 27.0. Type Threaded. Color Silver. A black steel headset for1-1/8” ( 28.6mm ) threadless steerer(unthreader) forks. Continental Italia. Country of Origin. Campagnolo Nuovo Record Headset Threaded Top Cup. We're the online bike parts dealer for rare components and spare parts for your restoration and repair. Here you will find original pieces of cycling history that cannot be found anywhere else. Nice Shimano 105SC Headset from January 1990. Aluminium / Plastic. Country of Origin. Crown Race Size. Continental S. Country of Origin. Good quality Shimano STX Headset. The top nut is missing the little black plastic insert, but still a nice item! Country of Origin. Steel / Plastic. Campagnolo Victory Headset Threaded Top Cup. We're the online bike parts dealer for rare components and spare parts for your restoration and repair. Here you will find original pieces of cycling history that cannot be found anywhere else. Campagnolo Super Record Headset Top Race. We're the online bike parts dealer for rare components and spare parts for your restoration and repair. 11.5Mm Race To Bottom. Here you will find original pieces of cycling history that cannot be found anywhere else. 1” x 24 BSC. Lovely Headset with original bearings set in the correct plastic races. Country of Origin. Campagnolo Victory Headset Threaded Top Cup. Italian Threaded. We're the online bike parts dealer for rare components and spare parts for your restoration and repair. Campagnolo Record Headset Top Race. We're the online bike parts dealer for rare components and spare parts for your restoration and repair. 15Mm Race To Bottom. NJS Certified. 27.0mm JIS crown race. Race Dia 27. 30.0 id head tube. New in the box Silver Alloy headset by Tange. NJS Certified. Race Dia 26.4. Color Silver Alloy. Type Threaded. Old Shimano HP-R501 Headset from the early 1990s. The plastic insert on the top nut is a bit worn, otherwise it is in very good nick. Country of Origin. Steel / Plastic. Campagnolo Nuovo Record Headset Threaded Top Cup. Italian Threaded. We're the online bike parts dealer for rare components and spare parts for your restoration and repair. Campagnolo Triomphe or Victory Headset Top headset Cup. English thread. We're the online bike parts dealer for rare components and spare parts for your restoration and repair. 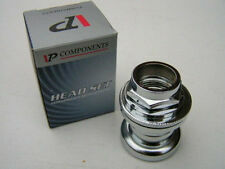 Campagnolo Triomphe Headset Top headset Cup. English thread. We're the online bike parts dealer for rare components and spare parts for your restoration and repair. Vintage Deff 1" multi-thread Chrome Casque Retro Road Racing Bike Eroica RARE! Super Rare Belgian Headset from the 1960s. Country of Origin. Campagnolo Triomphe Headset bottom headset Cup. any thread. We're the online bike parts dealer for rare components and spare parts for your restoration and repair. FITS FORKS WITH A 1" THREADED STEERER TUBE. MODEL: PASSAGE NEW. CROWN RACE: 27MM. HIGH-TENSION STEEL. LOWER STACK HEIGHT: 10.3MM. BEARING TYPE: CUP AND CONE. Campagnolo Victory or Triomphe Headset Threaded Top Cup. Italian Threaded. We're the online bike parts dealer for rare components and spare parts for your restoration and repair. Crown Race Size. Country of Origin. MODEL: LEVIN CDS. FITS FORKS WITH A 1" THREADED STEERER TUBE. CROWN RACE: 26MM. LOWER STACK HEIGHT: 11.2MM. BEARING TYPE: CUP AND CONE. FOR INTERNATIONAL SALES. ONE --GOLD (colored) Gravity/FSA Headset cap. Very nice Stronglight X13 Headset. This is a very rare headset with the classic roller bearings. In very good order overall. Country of Origin. MODEL: LEVIN CDS. FITS FORKS WITH A 1" THREADED STEERER TUBE. CROWN RACE: 26MM. COLOR: BLACK. LOWER STACK HEIGHT: 11.2MM. BEARING TYPE: CUP AND CONE. FOR INTERNATIONAL SALES. MODEL: LEVIN CDS. FITS FORKS WITH A 1" THREADED STEERER TUBE. CROWN RACE: 27MM. LOWER STACK HEIGHT: 11.2MM. BEARING TYPE: CUP AND CONE. FOR INTERNATIONAL SALES. FITS FORKS WITH A 1" THREADED STEERER TUBE. MODEL: PASSAGE NEW. CROWN RACE: 26.4MM. HIGH-TENSION STEEL. LOWER STACK HEIGHT: 10.3MM. 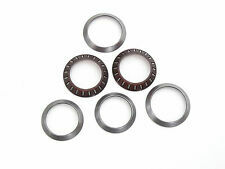 BEARING TYPE: CUP AND CONE.